Are you thinking of getting yourself an immersion blender? We’re with you if you believe that a wand blender does magic in the kitchen, making food and drink preparation fast and easy! In this article, we’re sharing with you some of the best immersion blenders we’ve found on the market. Aside from saving you precious time and effort, a good hand blender is supposed to help you make cleanup time hassle-free, which is a downside to most food processors and blenders. 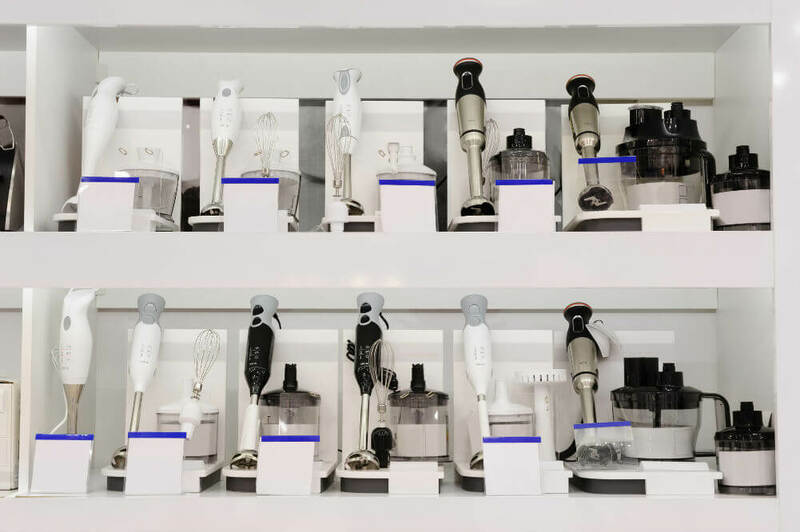 It must also display equal or almost the same proficiency of a good food processor or blender in achieving pro-level consistencies for your recipes. This wand blender is designed with an ergonomic silk-touch rubberized handle with a push button. It lets you switch between two speeds for your blending, emulsifying, and pureeing needs. It is fitted with powerful ice-crushing stainless steel blades to do the job and comes with a quiet, high-powered 300-watt motor. The immersion blender measures 2.4 x 2.4 x 15 inches and weighs 2.16 pounds. Its 300-watt motor allows you to crush ice and grind coffee beans. Although advertised to be ivory-colored, it’s more on the gray spectrum. This hand blender features an ergonomic pistol-like control grip with trigger, a bell-shaped base and an internal ribbing suction, stainless steel ice-crushing blades, and a non-scratch guard to protect pots and pans. It generously offers 15 settings for gradient control. This stick blender measures 2.5 x 3 x 16.2 inches and boasts of an 8-inch immersion depth that allows it to work with tall containers. It weighs 3.8 pounds and is fitted with a 280-watt motor as well as a 6-foot extra long cord. It also comes with a 25-ounce chopping bowl and 42-ounce extra large jug that store compactly. The cover of the extra large jug doubles as a non-slip base. On top of the two chopping bowl and blending jug, you also get a complimentary whisk attachment. Its 8-inch immersion depth is great in working with deep containers. It comes with helpful extras—a 25-ounce chopping bowl, 42-ounce blending jug, and a whisk attachment. All the extras it comes with will take up more space than you might have intended for an immersion blender. If you intend to use this to make a single-serving smoothie, you may find that the blending head will not work with the small cups you’re accustomed to using. This silver stick blender features a stainless steel shaft with sharp blades protected by a stainless steel guard. It lets you switch between power and turbo settings and also affords you pulse control. With a powerful 600-watt motor, it can whip, blend, puree, and emulsify various ingredients and even chop nuts. 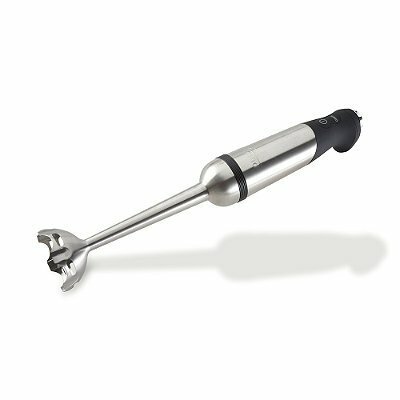 The immersion blender measures 3 x 17.2 x 3 inches, with the shaft alone measuring 9 1/4 inches long. It weighs 3.7 pounds. A whisk and a mini chopper can be purchased separately as accessories to this kitchen tool. Powered by a 600-watt motor, it handles the job pretty well and in less time. It can take on nuts, frozen fruits, and more with no problem. Made of stainless steel and is 9 1/4 inches long, the shaft can be used safely with hot liquids and in deep pots. Its detachable shaft makes it easy to clean. It’s also dishwasher-safe. The large blending head may not fit the mouth of some stainless steel cups that most smoothie-makers are used to. Its length can make storage a challenge, but its extra large base provides a stable foot to stand on its own, and the shaft is also detachable. It doesn’t come with a safety button like most immersion blenders. While it allows you to switch to pulse seamlessly, you need to remember to unplug the hand blender before cleaning it. All three immersion blenders are all well-designed hand blenders that which one to choose will heavily rely on your aesthetic sense or kitchen theme as well as your operation preference. For one, they all offer a deep shaft which makes working directly with soup in a pot easy. All-Clad KCZ750D can go the deepest with its 9-1/4-inch shaft. Second, controls are also quite easy. Chefman’s version offers a simple high, and low button setup and All-Clad KCZ750D has a variable speed control dial with power and pulse turbo settings, while Breville BSB510XL gives you 15 settings to choose from. The best immersion blender for you will depend on what you will be using it for. Will it be for soft foods or would you be handling some hard items like ice, coffee beans, or nuts? Of course, it’s important to note that the higher-powered wand blender will afford you the option to work with more and more kinds of food and complete the job in less time. Thus, the 600-watt motor All-Clad KCZ750D Stainless Steel Immersion Blender will prove to be the most powerful and versatile; the Chefman Immersion Stick Hand Blender with a 300-watt motor, second; and the Breville BSB510XL Control Grip Immersion Blender with a 280-watt motor, last. Regarding price, the Chefman Immersion Stick Hand Blender takes the cake. It is followed far behind by Breville BSB510XL Control Grip Immersion Blender and the All-Clad KCZ750D Stainless Steel Immersion Blender respectively. 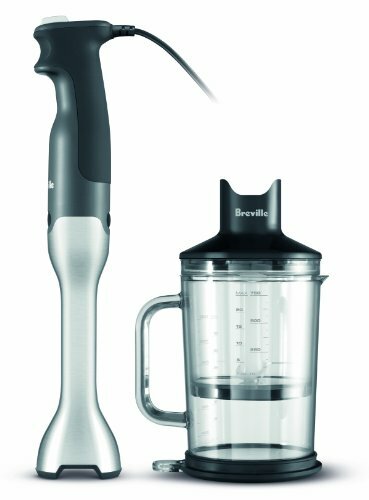 You need to take into consideration though that with the Breville BSB510XL you also get three complimentary accessories—the chopping bowl, blending jug, and whisk attachment. Getting all three proves to be convenient but can also be unnecessary, especially if you already have a chopping bowl or blending jug at home that you can use. If we are to choose the best immersion blender among the three, we highly recommend the Chefman Immersion Stick Hand Blender. It doesn’t have All-Clad KCZ750D’s 600-watt motor or Breville BSB510XL’s 15-setting control, but it offers a good balance of power, ease of use, and performance all at a tempting price. But if you want the power of a food processor in an immersion blender, by all means, get the All-Clad KCZ750D Stainless Steel Immersion Blender.